The Famous Snatcher, brainchild of God himself, Hideo Kojima. The amazing adventure game that Konami chose to deny us again and again, only to release it for the Sega CD, then, again, choosing to deny us again and again. Thanks guys. You’re Gillian Seed, a man who has no memory up until three years ago. After extensive training he goes to Neo Kobe (oh, and this is in the future) and becomes a Junker, a guy who goes after Snatchers. Snatchers, by the way, are bio-machines who kill humans and then take their appearance. Pretty creepy, right? You could be walking past Snatchers every day! You could be best friends with a Snatcher, heck, you could be married to one! And where, exactly, did these Snatchers come from, and why are they only in Neo Kobe? These questions need answers, dammit! Snatcher is a great adventure game (in the tradition of games like, oh, Shadowgate, or Phantasy Star Adventure) for many reasons. The first is that it isn’t completely retarded. You actually feel like you’re doing things, and making progress, and being a real Junker detective guy. Not, like, put this rune on this staff and walk exactly three steps backwards and an ogre appears that you have to put to sleep with the magical bucket you may or may not have picked up at the very beginning of the game. The world of Snatcher actually makes sense. Another winning quality is its humor. Any game that breaks the fourth wall, makes a fool of its protagonist, and even goes so far as to make fun of itself earns some serious cool points. 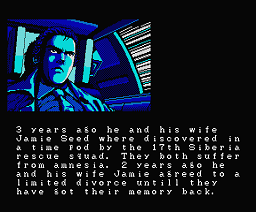 As far as how this one is different, depending on who you talk to, the MSX version of Snatcher is the definitive edition (graphic/sound quality aside). If I remember correctly, this is missing Act 3, which was added on to the Turbo CD version. I dunno, find out for yourself. Play! 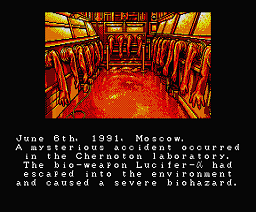 This translation was originally released as a series of fully translated disk images. 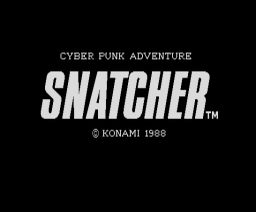 However, patches have been created for use with your own Snatcher disks. Make sure your files match the checksums below. If you download the disk images directly from the translation website, there is also a Disk 0 that includes some utilities for copying the game to a MSX local hard drive, in case you hate swapping disks constantly. The game is almost fully translated, however there are several typos in the script, as can be seen below. Perhaps an additional go-over would be an idea for the future?